Musical performances aside, I was impressed with the organization of the festival — everything was run smoothly. Check-in was quick, and the stages were across from each other in the park at a distance that wasn’t too far (each band took the opposite stage than the previous band), with food trucks in the middle. The bands stuck pretty close to their projected set times, and the crowds were smaller than I’d expect at an outdoor festival with these musical acts — not so small that the space felt empty, but there was room to move around and get good spots to see the stage(s). 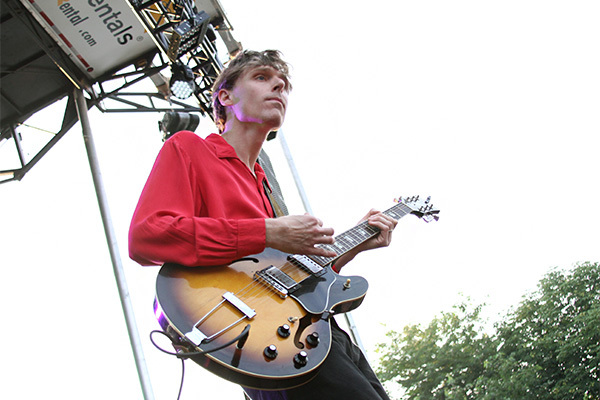 Across the field, Joel Plaskett and his Emergency backing band were to begin. Plaskett was introduced by sportscaster and music enthusiast Dave Hodge (I admit to not knowing this until being told after the fact), saying Plaskett’s set would be the best time to be had in Canadian music. Plaskett definitely has the stage presence down after his many years of performing, though I found their set to be a bit hit-and-miss. Their hits REALLY hit, such as the Canadian rock anthem “True Patriot Love” and their epic version of “Work Out Fine” that worked in a medley including an April Wine song, and “Doo Wah Diddy Diddy.” Their mid-set acoustic break was a refreshing change, and Plaskett’s stage banter was interesting, especially when he started talking about John Cabot and the Cabot trail, his inspiration for “On The Rail.” Their middle-of-the-road songs were where I found my attention drifting. 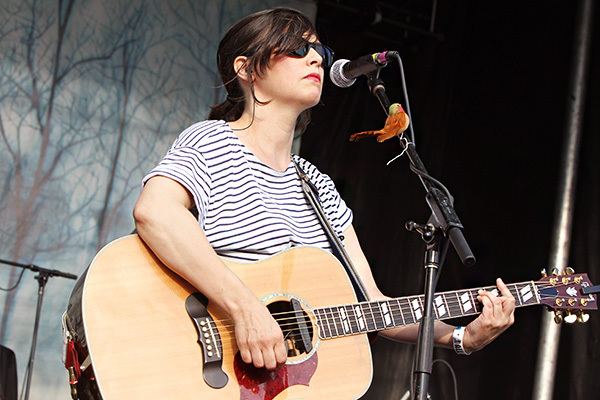 Finally, it was time for the headliner, She & Him — Zooey Deschanel and M. Ward. Pre-set, everyone had noticed the signs around the venue saying, “At the request of Matt and Zooey, we ask that people not use their cellphones to take pictures and video, but instead enjoy the show that they have put together in 3D,” and security guards were quick to catch and hound people using their phones, which put a bit of a damper on the set. Deschanel and Ward were backed by a large group of musicians, and they played through most of their three albums (not including the Christmas album): Volume One, Volume Two, and Volume 3. 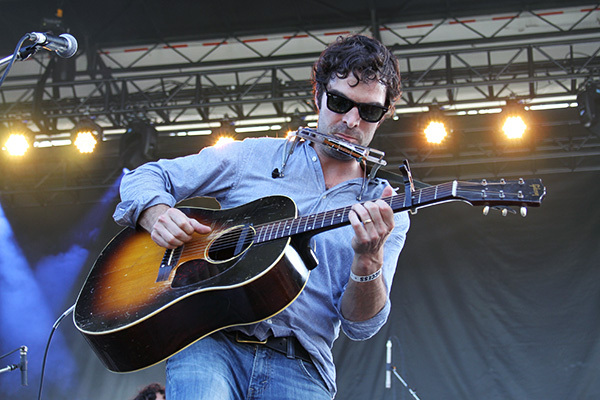 The repertoire ranged from alt-country to old-timey pop. Deschanel had a low-key stage presence, especially compared to Plaskett, and her voice didn’t hit the notes perfectly throughout the set. I didn’t mind the imperfections, though; they made the cutesy music seem more natural, and the set more intimate. Deschanel’s strongest points were her piano solos and her stripped-down cover of Smokey Robinson’s “You Really Got A Hold On Me” with Ward. Her cover of “Unchained Melody” with her two backup singers (Abigail and Lily Chapin of The Chapin Sisters), in front of a starry-lit stage and a hushed crowd, was captivating. Ward’s guitar solos and gritty singing voice added some welcome roughness to the sugary sweet tunes, and guitarist/bassist Mike Coykendall’s whistle solo was one of the highlights of the night. Deschanel spoke to the audience a little, such as thanking an audience member who liked her dress (and saying it was custom made), asking if we were all from Canada (“we like Canada”) and having us all participate in a call-and-answer for “In the Sun.” They ended the night on “Sweet Darlin,” with the fitting lyrics, “just a little bit longer now…” before leaving the stage by 11pm. TURF was run the way a Toronto festival should be. Let’s hope it becomes an annual event.